Inform your customers and support your staff. Build loyalty. 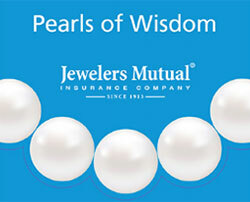 Mention Jewelers Mutual as an option to protect jewelry. Offer a higher level of service and show your customers you care by ordering your FREE jeweler resources! Easily raise awareness* of insurance by putting information directly in the hands of your customers with these personal jewelry insurance brochures. May be ordered with or without a folder. Order brochure holder separately. The jewelry you sell might be one-of-a-kind and it certainly has a special meaning to your customers. 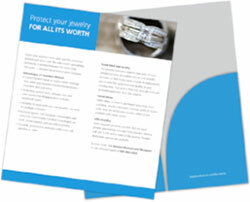 Make sure they know how to safeguard it from loss, damage, theft, or disappearance with our Pearls of Wisdom brochure. Personal jewelry insurance not available in Quebec.